When Boubacar Traoré first achieved fame in the 1960s, it was tethered to a social responsibility. Hits like Mali Twist were immediately swept into the narrative of a joyous nation emerging from colonialism, but even the most frivolous-sounding dance beats were anchored in lyrics that called on Malians to transform their homeland. His songs were inescapable on the radio, blending American blues and classical Arabic melodies to create a new genre of West African blues. Each song an anthem in its own right, Boubacar’s work became synonymous with a young and hopeful national identity. His innovation in music became a template to share Mali’s triumphs and defeats, as well as his own. 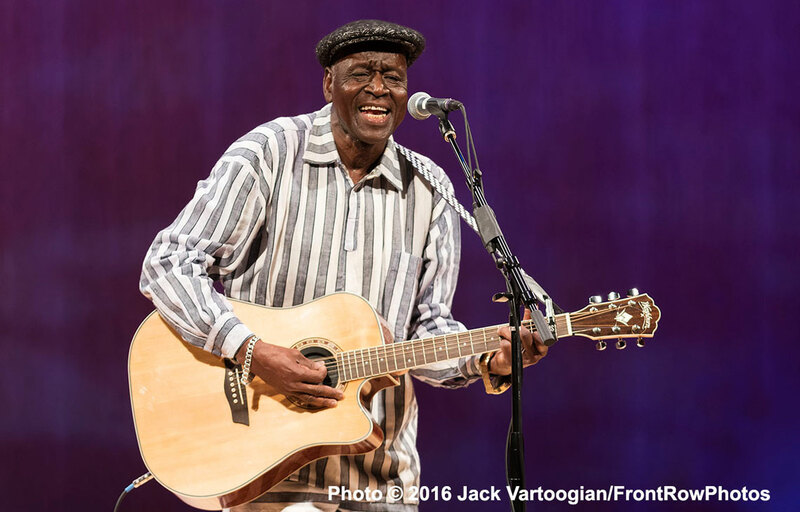 And by the time Boubacar reached the stage last week at the Metropolitan Museum of Art as part of the Desert Blues series from the World Music Institute, he had collected enough highs and lows to fill the museum’s archives. Fans still lament that the man who brought Mali’s music to an international stage would live most of his life in extreme poverty, at one point working as a migrant laborer in France. While Traore can sing of victories these days, they come with a canon full of cautionary tales. Since he didn’t record in his early years, he was denied the royalties to his ubiquitous hit songs. When Malian president Modibo Keïta was overthrown in 1968, Boubacar’s music also suffered, disappearing from the airwaves because of the songs’ affiliation with the previous regime. Personal loss, an exploitative music industry, and political upheaval all caused him to uproot from Mali, staying in France’s immigrant shelters and camps where he would look for work in construction. It’s perhaps due to these hardships that a packed house stood before Boubacar at the Met and marveled at his joy. People love a happy ending, and Boubacar was eager to share his with them, dancing to every song he performed. But his lyrics are no less harrowing and his experiences are ever present with each blues jam. It wasn’t long ago that the very songs he played on the Met stage where the ones he performed in immigrant shelters in France, as was presented in the French documentary of his life, Je Chanterai Pour Toi. While the film and Boubacar’s audience have no choice but to delve into the political context of his music and the spaces it occupies, Boubacar is wary about linking his art to any cause. His music, first and foremost, is for the people he loved, and whether in Mali or the Upper East Side, his intention is to build a community. 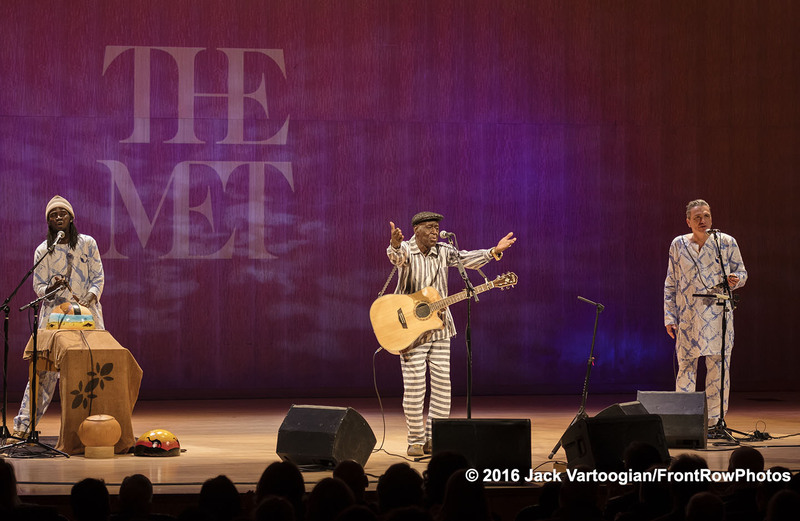 When the expert blues guitarist stepped onto the stage of the Metropolitan, he was flanked by Alassane Samake on the calabash and Vincent Bucher on harmonica. The trio kicked off with songs like Dounia Djanjo and N’Dianamogo, the latter being a loving tribute to Mali and a celebration of the land. And right away, the audience is warmly welcomed into an intimate circle, one where you can see the playful banter among the artists on stage and hear what sometimes feels like an improvised jam session on a neighbor’s porch. And within that improvisation, many influences become clear. Classical guitar spills over space-age harmonica solos that, with eyes closed, could have easily been mistaken for an electric guitar with a whammy pedal. Bucher’s inventiveness on the harmonica is what makes him such a great match for Boubacar, who sees it his own personal challenge to weave as many octaves and influences as possible. (He got the nickname Kar Kar, which loosely translates to “the one who dribbles too much” in Bambara, from when he played soccer as a kid. The nickname holds up to his musical stylings, as well.) The camaraderie was contagious. Boubacar would cheer and laugh in delight at each one of Bucher’s harmonica solos, encouraging the audience to do the same. Conversely, when Boubacar would ease into a guitar solo, feverishly creating a new sound that pays respects to American blue and kassonké, a style from the Kayes region, both Bucher and Samake would seem to bow their heads in reverence. Halfway through his set, Boubacar slows things down with Farafina Lolo Lôra, one of his earlier, more melodic songs that asks its listeners to dedicate themselves to their communities. One of the earliest highlights was his rendition of Hona, a song whose tempo, at first, reminds you of running through a crowded street, with a rushed and complicated guitar tune playing. And then suddenly, Hona arrives at its destination, and falls into Boubacar’s bluesiest riffs. Boubacar, who is well into his 70s, never stopped dancing for the duration of his two hour performance and encore. Whether swaying to the slower ballads or two-stepping to his biggest hits, his feet glide back and forth on the stage all night. His constant smiling, dancing and call-and-response games with the crowd keep the energy high all night, where Boubacar seemed to tease the audience that he could dance and they couldn’t. The crowd is just as animated, to the point where we are clearly beginning to resent our seats. It’s probably considered impolite to stand on your seat and dance in the Met Museum’s Grace Rainey Rogers Auditorium, but if it ever happens, the layered dance riffs of Bembalisso will be the catalyst. While the trio began with a beautiful harmony for fan-favorite Minuit, it quickly turned into a call-and-response with the audience, whose clapping and singing nearly overtook the stage. The crowd did quiet down to watch in awe as Boubacar asserted his unmatched vocals in Mariama. His voice when he shouts for Mariama to come back is just as clear and has only become more harrowing. Over the last fifty years, Boubacar Traoré has often been called the voice of Mali, but the meaning of that title has changed. He’s isn’t penning national anthems or campaign songs, nor was that ever his intention. His music is, however, still a work of reverence and respect to the country, its land, and its communities. Each song is a deeply personal love song, whether it be to his late wife or a lost grove in Kayes. Whether you share a language with Kar Kar or not, blues is the genre best equipped to convey his loss, and he uses it to build community wherever he plays. Listen to Kar Kar's hits here!